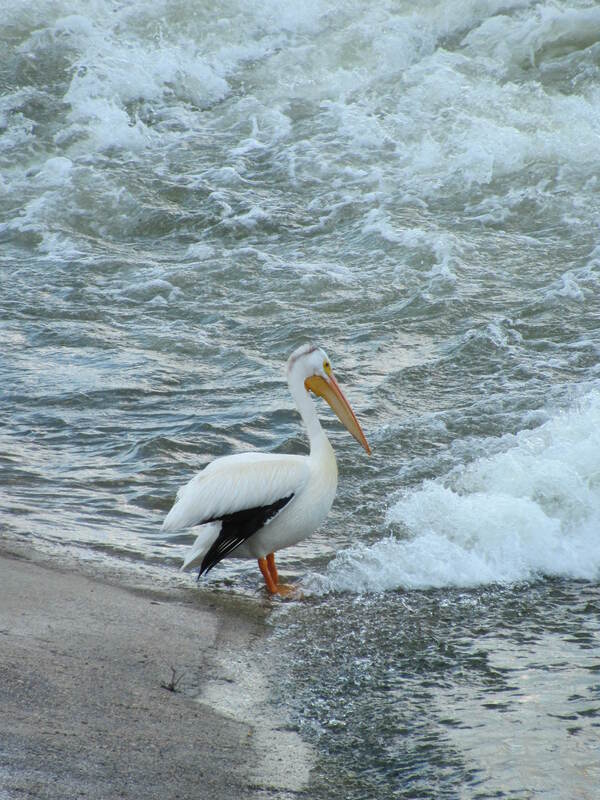 For a pelican, he sure looks a little hesitant about getting into the pool…. Do you have any phobias or fears that make you hesitate? This entry was posted in Bird, Outdoors, Photography, Wildlife, Wildlife Photography and tagged American White Pelican, Canada, CPR Bridge, Fear, Pedestrian Bridge, Pelican, Phobia, Railway Bridge, Saskatchewan, Saskatoon, South Saskatchewan River, Wordpress. Bookmark the permalink. ← From Patterson Garden, University of Saskatchewan. Oh yes, I’m not very good at heights, nor underground enclosed spaces… completely irrational, and I try to pull myself together. But my brain just gets the “danger” message! Maybe your pelican is just contemplating life before he jumps in? It’s a nice shot of him! You’re right, it’s so completely irrational to be afraid of some of these things, but it’s really difficult to convince yourself otherwise! It’s funny how our minds work…. No one else up on the bridge when I crossed seemed to be bothered in the slightest, I felt sort of silly being so scared. LOL, that’s too funny! When it comes to chocolate, I really SHOULD hesitate! which comes out of a tree. Yes! My sentiments exactly. It’s not that I don’t love salad, mind you. I just don’t hold it near and dear to my heart like chocolate. I’m not a fan of deep water, either – I like to be able to put my feet on solid ground, as I can’t swim! I’m with the pelican. I loved the pelican photo! Heights do it for me now, though when I was young it never bothered me at all. My family and I were in Austria a few years ago and went on a cable car up to a glacier. I managed to control myself until the car stopped for about five minutes, seemingly hundreds of feet up in the air, and all we could hear was the wind as the car swayed about. I’m afraid I completely lost it and both my daughters started crying too! Oh dear, my poor husband! Oh no – I can totally sympathize! I wouldn’t have enjoyed that at all! That’s absolutely terrifying! I’m with you and the pelican. I think I’d wait until I watched a very large person cross safely to the other side before I’d try it myself. Yes – I should have done so! Unfortunately, I had already committed to the crossing…the metal staircase to get up to the bridge was so freaky in and of itself I actually wasn’t sure I could turn around and walk back down. Crawl, maybe, crying all the way…. You should research the Carrick-a-rede rope bridge, in Northern Ireland. It is a rope bridge connecting an island to the mainland, for use by fishermen. Needless to say, neither if us could manage the first step! Oh my goodness, there would be no way I could cross that bridge – just looking at photographs of it is truly heart-stopping! http://en.wikipedia.org/wiki/Carrick-a-Rede_Rope_Bridge Incredible scenery, though – and I can see why it’s such a tourist attraction. I’ve just followed your link and have learned there is now a new and safer bridge. We “faced” it in 1984, pre any of these developments! I hesitate at heights and tight enclosures and run from snakes of any kind. Thanks for the great picture of the pelican! We have the brown ones here year around but the white pelicans come down in the fall and spend the winter with us. When it starts to get hot in the spring they gather in a group and head north. Yikes – snakes! I’m glad we don’t have many species here; we don’t see them unless we go further south or into the badlands. I wouldn’t be keen on having them in the garden! I don’t think I’ve ever seen a brown pelican, I wonder if we have them here. I will have to check. Are they smaller than the white ones, or about the same size? Oh heights especially a bridge as you described it or looking out over the edge of a bridge or building…. Ugh…looking out over the edge of a building does it for me, too! So frightening! What an unusual bird that Pelican is, I love to see them fly. I t always looks to me as if they have strapped a grocery bag right under their chins. And fear of heights….I am right there with you! I love your description of pelicans – you’re right, they do look like that! 🙂 Very interesting creatures. I’m always impressed with their large wingspans – it’s amazing when they land. “Hesitate” is an understatement when it comes to my fear of heights. There’s NO WAY I could even white-knuckle my way across a bridge like that or ascend to a height that freaks me out. I tried a few of the more popular ways of overcoming it – they made it worse! So for me, I’m perfectly happy keeping both feet firmly on the ground! I used to be deathly afraid of spiders. Over the years I’ve relaxed a lot, especially if they’re in the garden. I faced the fears and they got easier, but if a spider surprises me I’ll still jump. I’m with you on the spiders…but unlike you, I still haven’t figured out how to get over it. But I’m learning to appreciate many (beneficial) insects and spiders the more time I spend out in the garden, that’s for sure. A friend once told me to think of all spiders as female. I don’t know if that helps you in any way, but it did make me think about it being someone’s mother instead of someone out to get me. Spiders are vilified in horror movies, Halloween scenarios, even Harry Potter. Is it any wonder we’re creep out? Rationally, though, 99.9% of them are harmless to people. I’m not a fan of deep water, either! I like swimming where I can touch the bottom of the pool or river, that’s for sure. A bridge like the one you pictured gives me the willies, too! 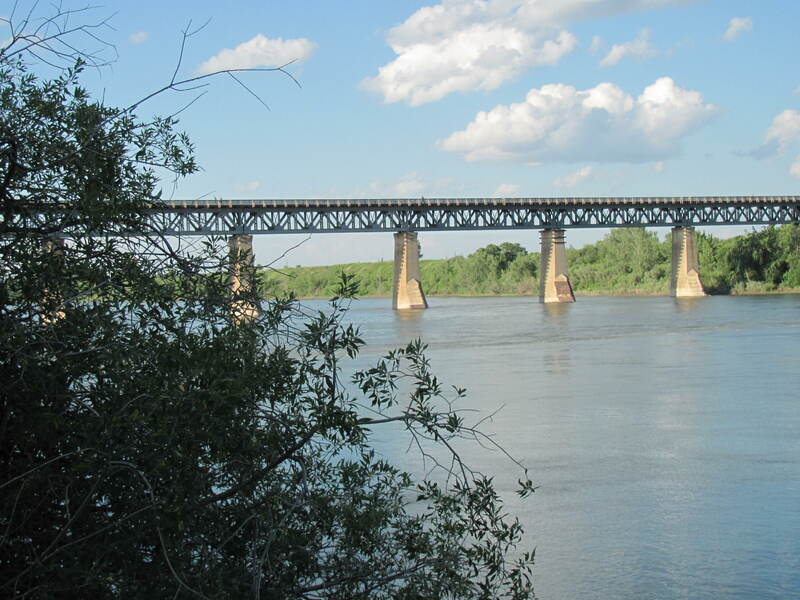 I remember going across one with friends on bikes–they all rode across and I had to get off and walk. A too active imagination! Those white pelicans always seem so out of place up north! Cool picture, and congrats on making it across. I share your fear of crossing water on a bridge and those grated drawbridges were always the worst. Surprisingly enough as I get older it’s fading and the old panic doesn’t come anymore! You might be right…maybe it’s not trepidation at all, but anticipation of enjoyment!